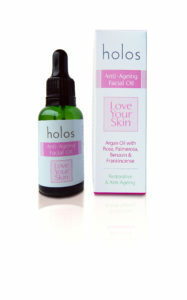 Holos Love Your Skin Anti-ageing Facial Oil is Holos’ award winning best seller. Everyone loves it and everyone needs to have it. Here are the 12 reasons you need to get yours today! It feels and smells Amazing. It plumps your skin up by adding good fats to it. It smooths out fine lines giving the skin a more even texture. It locks in water to keep the skin hydrated. It is excellent for treating dry skin. 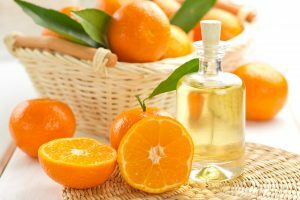 It helps to keep oil in the skin so also suitable for oily skin. The Essential oil blend help to bring down redness and inflammation. It’s plant-based so beautifully natural. You can use it on its own as your moisturiser, or underneath your moisturiser. It absorbs faster than a moisturising cream. All you need is 4 drops for the face, neck and around the eyes. Yes I said “eyes”. It’s a perfect substitute for eye cream because it is so absorbent. This is my desert Island product. I use it morning and evening instead of moisturiser and even though I’ve been using it for 4 years, I look forward to putting it on every day! 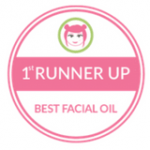 Check Testimonials on the Home page to see what other people think about our Anti-ageing Facial Oil.